When people ask me what my highlight of the Sisalla Melbourne Design Tour was, it’s an easy one – visiting the Mim Design studio. The chance to peek behind the scenes of one of the best (if not the best) interior design studios in Australia was incredibly insightful. I have always been fascinated by top interior design practices, how they are run, and the steps they have taken to become a truly successful business in this highly competitive industry. So, naturally, I arrived at Mim Design with a curious mind, ready to soak it all up. Now I think about it, maybe organising the tour group was just an excuse for me to get backstage! Even if you’re not familiar with the Mim Design brand, you will definitely have seen their work published over the years or dotted around Pinterest. You might even be one of their 102k Instagram followers! They work across a wide range of sectors including residential, multi-residential, hospitality, workplace, event design and retail – so that’s pretty much everything! Diverse as the projects are, one thing is consistent – their use of luxurious finishes and impeccable detailing. The mastermind behind the brand is Mim Fanning, who founded Mim Design twenty years ago with her husband, the other half of the dynamic husband and wife team – just like ours! Mim graciously offered up her valuable time for our tour group and passed on some incredible knowledge and insights that I couldn’t help but share. It all started with a tour around the incredible studio. It was Mim herself who was our personal tour guide, so we were all on our best behaviour! We wandered wide-eyed through the office space, past delicious slabs of stone samples and the talented Mim Design team. Next, we entered the library, and suffice to say we were all blown away. Not only were the shelves stocked with the finest quality finishes, fabrics, stone, hardware and everything else you could imagine, all of it was all perfectly organised and catalogued! You could almost see every person in our group of designers taking mental notes. For me, it was the larger-than-A3-sized shallow plastic tubs with neat stacks of fabric samples categorised by colour that stuck. At Sisalla, the samples are currently in shallow drawers, but having them in clear plastic would be a lot more accessible. Maybe not everyone finds that exciting, but we did! Another great takeaway for me was learning more about the design process. I noticed that the designers were working on Autocad, and was keen to find out more. They explained that they have looked into 3D modelling software, but for now, they use SketchUp to produce 3D visuals and then document their projects in Autocad. That’s just how we do things at Sisalla, so it was reassuring to hear that our methods were the same! Mim also talked us through the range of projects that were displayed on the studio walls, explaining how diversity among the work has been achieved by the team striving to design something different and innovative for each project. Our tour group (myself included!) were privileged to hear in detail her experience of working on such inspiring designs. In particular, I found it truly insightful when Mim talked us through the complete client presentation for one of her penthouse projects. As expected, the visuals were exquisite and the designs gorgeous. Mim explained that the visualisations were created in SketchUp and worked over in Photoshop by the very talented team. The rendering effect took on an almost watercolour feel, with a soft bleed out at the edges. 3D views and elevations were shown, so lush and detailed with lighting effects and shadows. We were all silently staring at the screen in awe. Joinery details were shown as well as the overall views, so that the client would have complete confidence that absolutely everything was considered. 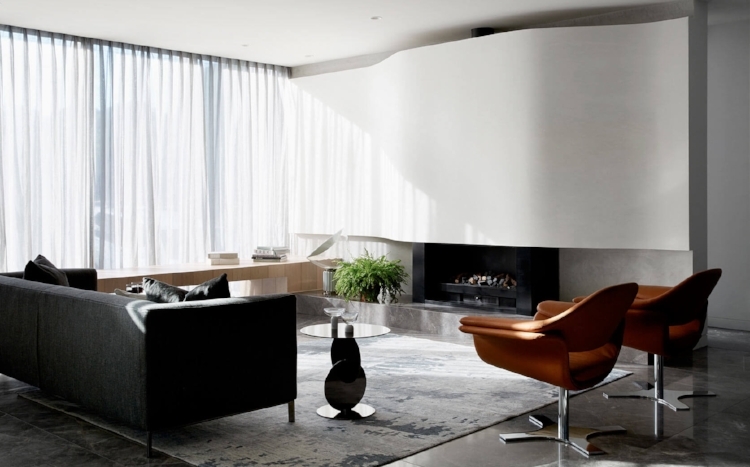 It was a very rare insight into how the top interior design practices in Australia work. Gorgeous curves and a lovely capture by Sharyn Cairns. I love these vignette shots. At the end, Mim asked us if we had any questions. Truth be told, we were all quite mesmerised and speechless! Once we found our words, the questions started flowing, and the answer which really stuck with me was this – drive is the first thing she looks for when hiring designers. Above being a great designer, they must have drive. Take note, graduates! She also talked about how important it is for her to feel excited to come to work each day – not just for herself, but also to inspire the rest of the studio to feel the same. I noticed that when we arrived Mim was busy marking up drawings – something that she explained helps her stay on top of the work. Her hands-on approach means she is not just across every project, but also excited about every project. Finally, Mim gave us some insight into the business side of things. She explained that diversifying the practice was an important move in terms of safeguarding Mim Design against the ever-changing climate of the interior design industry. With many diverse sectors now established, the longevity of the business is much better protected. I found this to be quite interesting – we’re all busy now, but who knows what will happen in one, five or ten years? 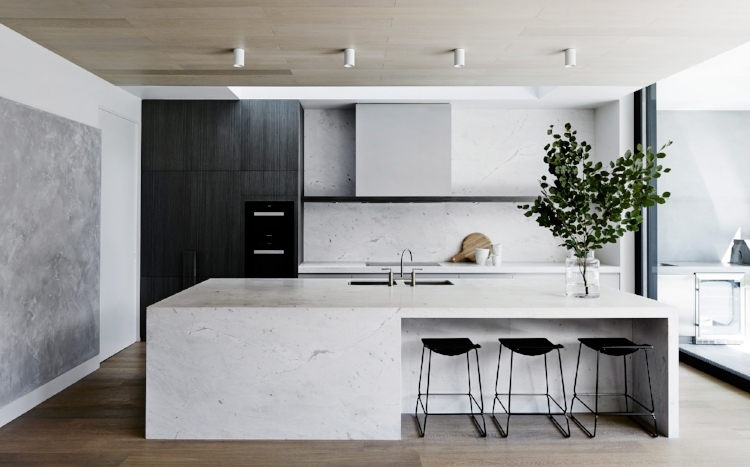 AAP Residence by Mim Design. After our visit, we all collectively pinched ourselves. It was a wonderful experience, full of brilliant new knowledge and incredible insight, and we felt truly blessed to have learnt from the best – thank you, Mim! 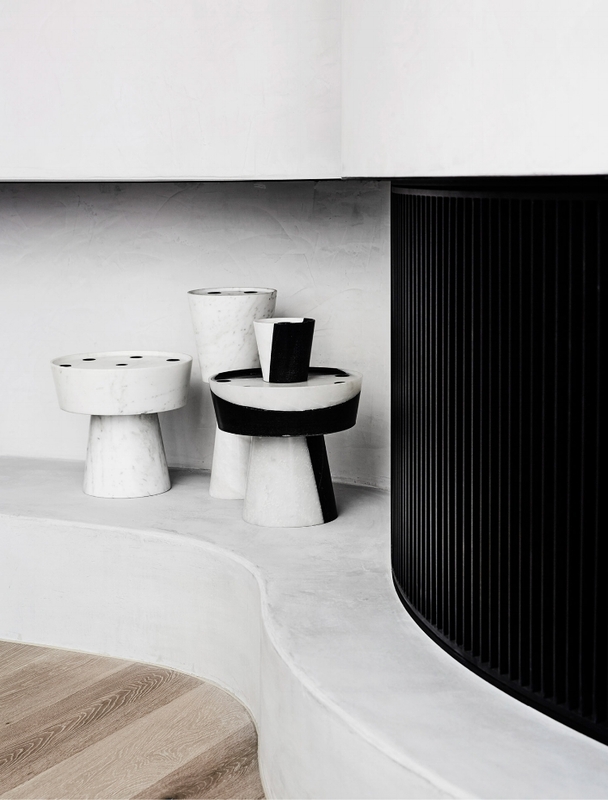 If you'd like to join us for our next Melbourne Design Tour, book now! Limited to a small group of ten, we take a shuttle around Melbourne to visit interior design studios and showrooms.